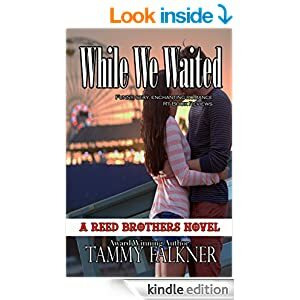 While we waited Tammy Falkner. I read a lot of books and sometimes I just don’t keep track of new releases in series. That’s what happened here, I adored – a five star read – Tall, Tatted and Tempting, it was for me a perfect mix of hot, sensual romance, drama and a solid story wrapping it up. I did intend to look for more as they came out but….too many other books got in the way, so when I saw this one was part of the series I jumped at the chance to review it. There’s a lot of links to characters and stories in past books, but this is a standalone so I thought it would be fine for me. From that viewpoint it was, although there were hints of previous things it didn’t stop me from being able to keep up with the story. I loved the characters, felt for poor Finn with her mum being mentally disturbed, it had given her an awful childhood and it made sense of why she didn’t do anything but one night stands. The foster parents were absolute gems, so solid in their love for the girls, so un-judgemental, they were just there to catch them when they fell and encourage them forward again. Sadly though it was a sweet, tender romance it lacked any real drama and I need that. I felt it was sort of one paced, all very sweet, and moving forward, with Finn and Tag quickly falling in love. It just seemed to be all too smooth, too slick, too happy, happy, happy, and I need some hiccups, some bumps in the road that fill me with emotion, and I just didn’t get it. I enjoyed reading this but its a one off only for me.